"It may be tiring and seemingly hopeless, but we need to keep alive, to continue the discussion of fundamental issues that cause our national predicaments, especially to those who can not escape/emigrate, the uneducated, the impoverished. And hopefully, we can reach and help them gain an appreciation and understanding of "what's going on." Because without the impoverished majority knowing, they can not unite and act for radical changes that are long overdue. We may not see the realization now or during our lifetime. But we have to try and do so, for the next generations. For another, there's no place like home, our country of birth. That's how I feel and think." ELECTION MAKES A DEMOCRACY? CAN WE CHANGE THROUGH ELECTION?....DEJA VU CELEBRATION !! It is election time again in our homeland and we native Filipinos repeat (every 3 and 6 years) to enjoy the delusion that we are a democracy because we can vote, which to many of us natives, solely defines it. Of course, it is not that simple. But some serious introspections though long would hopefully lead to understanding (and that's why I would not expound here, but have addressed in past blog posts). Our elections, especially in recent times --with the easy reliance on the television and social media-- both sources of the instant, often lazy and simplistic way to "information," especially for those who can not/do not read and neither want to question nor think, our election has literally gone to the dogs. Yes, to the dogs, as it has been expected. If one can see the forest from the trees, from the time we became "independent." Yes, to the dogs can be expected to continue in perpetuity/ad nauseam as the trend in the next generation or two; that is, 25-50 years (or more and worst). We native Filipinos have been conditioned to believe that "the youth is the future of the country!" Thanks to our supposed national hero Jose Rizal who was an intellectual, anti-friar pamphleteer and therefore was sent to the firing squad, shot dead as desired by the Spanish friars. As some of us know from our history, many of his fellow ilustrados/friends were not like him; most of them became opportunistic traitors (and sadly have since become role models of our people/politicians). But I think Rizal did not foresee the kind of "educated" youth we have after his death, who were/are conditioned and trained to have a colonized Filipino mind. Therefore, our youth grow not having a truly native, nationalist identity compared to most, if not all, other citizens of the world have for theirs --thanks to our unquestioned adaptation of westernized/Americanized educational system. Ergo, never coming to its own with national unity and identity to be a nation (not just a country) ; hence living and trying to be Brown Americans "lost in translation" in his/our own homeland. "It may be tiring and seemingly hopeless, but we need to keep alive, to continue the discussion of fundamental issues that cause our national predicaments, especially to those who can not escape/emigrate (never fun), the uneducated, the impoverished. And hopefully, we can reach and help them gain an appreciation and understanding of "what's going on." (NOTE: I must admit that my use of English in my writings is part of my colonized mind. Using a foreign language defaults one to think foreign. I tried several postings in Tagalog and had it reviewed by a friend who taught Pilipino; and she said my Tagalog pieces sounded foreign. Anyways, I had to give up because it was really difficult and very tedious; the experience demonstrates what a westernized education does; our textbooks, lectures, etc. being in English. My travels abroad showed other countries used their own languages as the medium in everything. Language unifies a country as a nation. Thus, in our homeland, we have an elite and middle classes - who dominate our socioeconomic and political milieu- generally proficient in the English language; distant and/or aloof, never identifying with the massive lower class that are unable to comprehend or kept ignorant (by the ruling classes). A country of 108 million people, with enough schooled/educated citizens, unable to rise as a country united; to be aptly called a nation; thanks to our colonized minds (among other internal and external impediments, see below links). The 3 Gs': "guns, goons and gold." corruption, jueteng, smuggling, spoils system, pork-barrel, ruling class/elite, oligarchy, booty capitalism, caciques, ilustrados, technocrats, lack of nationalism, family, kinship, rent-seeking capitalism, dictatorship, politicized military, political dynasty, weak state. "sick man of Asia," etc. All these preceding cliches and/or terms have been used to describe, refer to our homeland and our kind of politics. Those of you who visit this blog may have noted its mission statement at its top heading, which highlights the need for educating ourselves, native Filipinos for mass nationalism. I still strongly think and believe that fostering and acting with Filipino nationalism in our heart, mind and spirit is imperative. In my previous 2007 post: impediments to Filipino nationalism, I listed tribal mentality as the #1 impediment and therefore a primary obstacle to progress, that is, towards the common good of the native Filipino majority. Tribal mentality, applied and expressed in its narrowest form, i.e. the Filipino family --with its bilineal extension through kinship and the kumpadre/kumare system of social relations-- has continually demonstrated its destructive effects in our pursuit of national unity and sovereignty, thus impeded the formation of a national community and a government that would work for the common/public good. Our tribal/familial mentality has a long, continuing history in our homeland, thus keeping our homeland stunted as a traditional/rural society --though with some pockets of modernity or urban setting. Fast forward today, in the realm of politics this mentality has brought us the so-called family/political dynasties, i.e. the few, typically monied elite families who lord/rule over the socioeconomic lives of all. During earlier times of our so-called democracy, this rich minority was content with employing/using elected officials to satisfy its economic interests; but in recent decades has crept to directly seek electoral/public offices to gain and directly use political power for its selfish ends. Even term limits do not deter these greedy creatures for political power (as they tasted its usefulness in their unending thirst for economic power, ad nauseam) and so they run for other public offices; sit and wait to get back. Having tasted political power and influence, these monied elite families have come to believe that they have the sole right to political power in their localities (town, province, region, and ultimately the country), with easy access to and use of public/government money for their own private use, to further their material enrichment and influence, consequently to effectively form an oligarchy or a government by plutocracy. Their paid mouthpieces or buddies in the mass media or so-called social media duly advertise that they deserve to rule. The family --with its family values, attitudes and behavior-- which we native Filipinos treasure as the most important institution in our society has its downside and a grievous one at that. Though theoretically family political dynasty is not in itself necessarily bad, in our homeland it has oftentimes shown its worst characteristics, at the expense of the country, that is, of the native Filipino majority. Family political dynasty ensures maintaining political power within the family circle; political power ensures further accumulation of economic power (wealth) by plunder of state resources which in turn reinforces political power. In the permanent pursuit of power, wealth and influence, the tribal/familial mentality has continually created generations of the ruling elite as political dynasties in the Philippines , i.e. from granddad to son and/or daughter, wife and/or husband, to niece and/or nephew, the in-laws, etc. pork-barrel - Filipino legislators are allocated large sums of the annual national budget (200 million pesos for each senator and 70 million for each representative). Pork-barrel is now euphemistically renamed as a program called the Priority Development Assistance Fund (PDAF). That's why candidates see their electoral expenditures as worthy investments and rationale for using the 3Gs. All or some of these practices are particular not only to us Filipinos, however they are uniquely dominant throughout our local and national political lives and which altogether make our country a weak state, given that the practical takeover by the political dynasties, has resulted in the common or public good being ignored. The Marcos Dictatorship was initially proclaimed as designed to end the then (old) oligarchs. But while Marcos persecuted them, as most of them were his considered enemies, in lieu he created himself, his family, kins and cronies as the nouveau riche or the new oligarchs by enriching themselves in the most grand scale. Today, the old oligarchs were returned to power and regained what Marcos took from them and more, thanks to the EDSA Rebellion and the sell-out by President Cora Aquino, whose family is one of them, that is, belonging to fellow oligarchic families. The Marcos-created oligarchs and other new ones who benefited from the subsequent presidents (Cora Aquino,Fidel Ramos, Joseph Estrada, Gloria Arroyo and Noynoy Aquino) would continue to thrive, remain and grow stronger (including these presidents themselves, their kins, cronies and politicized military supporters). The reason being that the old oligarchs accept new ones, regardless of their publicly known thievery from the government coffers, thus providing so-called legitimacy to these public criminals. To those who follow political developments in our homeland are aware. The very respectable, former Senator Jovito Salonga has written two books on presidential plunders: by Marcos and Estrada. Thanks to this unquestioning acceptance by the old socioeconomic elites and by the so-called educated middle class, who are usually employees of the elites; and the inutile ignorance of the masses (busily struggling for daily survival) we native Filipinos have extremely short memories and thus assure that such history will continually repeat itself. BTW, let us not forget the Chinese taipans who also profit from this state-of-affairs and quietly laugh their way to their banks (they own several of the largest Philippine banks!). It seems we native Filipinos are the only people on earth who allow known thieves and rascals of public wealth to not only remain free but to rule us. And therefore, knowing these facts we natives deserve to be doomed throughout our remaining years; and unwittingly we doom our future generations unless we wake up and act --not only for economic and political changes-- but also for the fundamentally necessary, radical, social transformation. All the while we the so-called educated middle class (whatever is left of it) do not really care to act, i.e. at least inform/educate the ignorant mass, but instead remain arrogant and aloof while always blaming the latter. Hereunder I have transcribed two more chapters from "Soliongco Today" - a 1981 book of readings from a collection of articles/essays Soliongco wrote during the pre-Marcos Dictatorship years. Frankly, I do not know or remember him as his pieces were mostly written during my high school and college years (engineering and thus not so politically conscious yet). I do not know if he was popular then. A reader wrote to thank me and said that he read Soliongco pieces then; another charged that Soliongco is a Lopez guy (Soliongco was an editor at the Manila Chronicle). However, after finding that his essays were so full of critical, deep insights from observations during those late 1940s -early 1970s, i.e. the topics dealt with our kind of Filipino politics then, but which still hold much truth and validity today; I can not help but republish them so that seriously concerned Filipinos and our younger native compatriots can have information, gain conscious awareness and better understanding of our political realities; hopefully work to stop and reverse the great decay and perversion in our homeland politics that result in misery for the native majority. Those who take pride in their consciousness of history are fond of making convenient comparisons between the Filipino politician who plied his trade under the aegis of President Quezon and the Filipino politician who is flourishing today. The first, in the view of historically-minded observers, had dignity and aplomb, should be trusted to express himself in more or less grammatical Spanish, could negotiate the distance between the soup bowl and his mouth with exquisite elegance, and could trace his immediate ancestry to college-bred fathers and convent-raised mothers. But the second - the common run of politician who is now begging us to place our destiny in his hands for the next four years at least - is a different animal altogether. For to those who hark back to the impeccable manners of the senador or representante of three decades ago, the present day member of congress - the so-called sad average, that is - is a predatory hind in a Marzoto suit who glories in the fact that he eats with his hands, also uses toothpick quite naturally in company, and whose speech, in English or Tagalog, is as corrupt as his face. In a deeper sense than most people suspect, this contempt for the new breed is justified, for the unhappy truth which must needs be admitted is that, in the main, the Filipino politician who pollutes the atmosphere at the moment is contemptible. His mummery is of the highest order; and on the basis of his manner, thinking and behavior, it would be hazardous to invite him to your living room. And on the basis of honesty, he deserves to be in jail for the rest of his natural life. But I must hasten to state that the difference between the Filipino politician of old and his counterpart today are not, as the votaries of history would have us believe, in kind but in degree. For the congressman who swears allegiance to President Marcos is the spiritual brother of the representante who was ready and willing to lick even a faithful facsimile of President Quezon's boots anywhere and anytime. The outward differences in decorum and appearance are admittedly valid, but they are capable of being bridged by some finishing-school polishing, the kind that comes with sudden affluence, or with having a house in Urdaneta, or with having a certain familiarity with the various floors of Macy's in New York. The spiritual affinity which binds the present Filipino politician and his predecessor of the American and Commonwealth periods springs from their common and basic alienation from the masses of the people. It is this alienation which makes the Filipino politician of any era such a despicable character. But what is more significant is that it is this alienation which imparts to the political changes in this country the quality of alternation from bad to the less bad and back, never from bad to good. It is conceded that the cacique who once boasted of his ability to deliver huge blocks of votes on demand has lost some of his pristine powers. But he has been supplanted by vested groups, foreign and native, which, in terms of power and resources, are infinitely more dangerous to the national interest. But whether cacique or vested group, the fact which erupts everywhere in the nation is that the one or the other is behind the congressman or senator. The people vote, and presumably, elect, their representatives, but the reins which guide the latter are held, tightly or loosely as the occasion demands, by the powers behind the money bags. That politics is the key to all that is materially good in this country has been fully established over the decades -from the first election in 1907 to the present. The Filipino politician, therefore, be he a member of Congress or the governor of a province, as the tool of a powerful vested group or of foreign cartels, or acting on his own, is not exactly the symbol of self-sacrifice. On the contrary, he has done well by himself and in many instances, because of overflowing emoluments, he has become a sort of tycoon, perhaps in the minor categories, but a tycoon just the same. 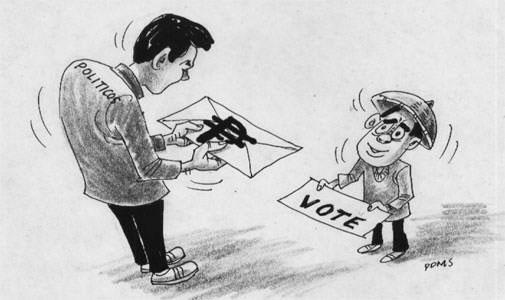 The huge business empires are perfectly willing to pay the price of the Filipino politician to the extent of enriching him, for those who run such empires are acutely aware of the fact that in the Philippine experience and according to Philippine scale of values, the act of subsidizing the politician is a fair enough price if set against the background of expected and garnered profits. Thus, it is not necessary to conduct a rigorous and thorough investigation to unearth the commonly accepted truth that the businessmen of the community, whether alien or native, are represented in the law-making body not only as citizens or individuals but as members of going commercial and industrial concerns. To express it in another way, there are many members of the Senate and House whose real and abiding loyalty is not to the broad masses of Filipinos but to the boards and chieftains of powerful corporations. But of course, the Filipino politician is an avid learner or is rich by inheritance or even by reason of his native ability. It is possible that as an adventurer in enterprise he has realized the difficulty of overcoming certain impediments to his advancement. There is for instance, the little matter of finances which, in the Philippines, are available only in impressive quantities in government financing institutions. Again, there are those little matters of Central Bank rulings which, in their application, reduce the speed of business and industrial progress. Under these circumstances, the idea that the harassed man of business must have a protector and an advocate in the councils of power easily become an incentive for action. And so it is not strange at all that some of the noisiest and most influential members of Congress are businessmen first before they are representatives of the people. The lesson that the Philippine political experience conveys in countless forms is that when the representatives of the people -the senators and congressmen- reserve their loyalty for their own interests or the business and industrial empires which have created them, a vacuum in leadership occurs and something like a dichotomy develops. On the one hand, you see the flowering of an oligarchy in which the Filipino politician, as a hired help or as an indentured advocate, becomes an appendage of the social and economic elite. On the other, you see the masses sundered from the seats of power and grasping in a forlorn fashion at futile ideologies, turning into reservoirs of hate and bitterness. But what is worse is precisely because of the developing vacuum, the demagogue of whatever hue finds a place and a following which eventually pose a danger to peace and order. And yet, this can hardly be avoided, for the very alienation of the Filipino politician from the masses and the loyalty that he harbors to the vested groups and foreign interests to which he owes his being are the ingredients of his corruption. He ceases to have any responsibility, save his responsibility to his economic masters, and the power that he holds by virtue of his office in the House or in the Senate has a way of adding to his corruption. This is why to an increasingly large portion of the masses, particularly in Central Luzon, the representatives of the people evolve into enemies of the populace. Against such enemies, the masses fend for themselves as best as they can. And almost invariably, fending for themselves means following the leadership of men against whom the laws of sedition and rebellion have been perfected. In societies where the democratic tradition has durable roots, the situation that i have described would be nothing but a short-lived atavism. For the people in such societies will have the democratic means with which to effect change. But in underdeveloped community like the Philippines where there is a dearth of democratic institutions, extremism is usually the first and last resort. Perhaps there will be a long period before the boiling point is reached, but that point will be reached eventually, and extremism in its ugliest aspect will rule. It would be unwise, I suggest, to rely too much on the apparent apathy of the Filipino masses. A good portion of them have been mesmerized by the usual palliatives of show and rice, but the other good portion is asking for rights and privileges. This is why there is discontent in the Philippine society. Not all the people are capable of being appeased by palliatives. And palliatives are necessarily temporary in their effect. Thus the discontent that prevails in Central Luzon has an ineluctable way of proliferating into other sectors which, in a tragic miscalculation, the politician believes to be secure. Another tragic miscalculation in the circles of the elite is that the forces at its beck and call -the constabulary and the Army- are sufficient to quell the rising political passions. At the moment, those forces are potent enough to meet the crisis. But how well can those forces stand against a people who have achieved unity through a common misery? Against the background of the advertised achievements of the government -on behalf of the people, it has been duly emphasized- these paragraphs are undoubtedly pessimistic. They are the observations of a Cassandra rather than a Pollyanna. The question has often been asked why candidates in the Philippines conduct their campaign as if they were circus barkers or medicine men; why, save in a few instances, they are indistinguishable from the mobs which attend their rallies. The question, it seems to us, is perfectly justified, for nowhere in the democratic world but in this country is the illiterate, bombastic, platitudinous campaign speech being taken with frightful seriousness - by the masses. Indeed, if Philippine politicians were to be judged by what they say and promise during their campaign, the conclusion could easily be drawn that their activities are more raw material of the science of psychiatry than of the art of politics. And yet, Philippine politicians are not exactly the blatant ignoramuses their utterances make them out to be. whether they pertain to the old, cynical school or to the new, smug theocrats, they seem to have undergone a siege of knowledge and imbibed some of its salutary effects. Of the first group, for instance, we offer as a specimen that presidential candidate whose manipulation of his credits in the government financing agencies is a brilliant display of cunning and intelligence. Of the second group, we offer that young man -also a presidential candidate - whose pronouncements on government, economics and politics would be intelligent did they not reek too much of the textbook. But if Philippine politicians have a mind of sorts, how is it possible for the vast majority of them to descend to nonsense and wallow there? The answer, we believe, may be found in the people. For the people, except when they are incensed by the inordinate corruption of politicians as they were in 1953 by the Liberals, impose modest demands on the candidates. In their current state of political illiteracy all the masses want is to be entertained before and after the elections. And so the ordinary run of Philippine politicians, whatever their age, by a compulsion too strong for them to resist, transform themselves into actors -and athletes. Election campaigns are waged by actors and athletes not on the basis issues and principles but on the basis of the ability to play a role or to shake hands and jump creeks and fences. Bread and circuses undoubtedly have the quality of an anodyne, but when the people find, as indeed they have already found, that the minimum wage is no longer enough to sustain them, they developed a perversity which makes it impossible to placate them. For what they are now demanding is a miracle the performance of which, we believe, is beyond the capacity of the present leadership. And yet, the people can not entirely be blamed. From the earliest days of self-government in 1935 to the present, they have been conditioned to political solutions as they only way out of their economic predicament, for the Filipino leaders who succeeded in occupying the positions of influence and power, discovered that the most effective way of dealing with the masses was to regale them with assurances of a sunny future. What they have thus created is a world of fantasy where the standard of values is set by the politician's promises. But the cruel realities of economics can not forever be dissembled by a politician's charisma. Sooner than later the effects of lack of production and of the gap between what the laborer receives and what the prime commodities he needs cost are felt. And those effects become sharper with every promise broken. The people begin to see the light and acquire an intransigence against politics and politicians. In a way, therefore, the politician ultimately becomes the prisoner of his own propaganda. He soon learns that the easiest way out is the hardest of all, and, worst of all, that the penalty he must pay for having created a world of fantasy is repudiation at the polls. It is because of his fear of this that he is forced, let us say against his will, to employ the harsh methods of dictatorship for the realization of projects which may or may not solve economic ills. The fault of many Filipino leaders is that in their moment of triumph, they refuse to reveal the economic truth. How much greater and how much more successful our presidents would have been if at their inauguration they had emulated Winston Churchill and told the people that they could not promise them anything but "sweat, blood and tears." What statesmen our political leaders would have been , if instead of promising the people the pot of gold at the end of the rainbow, they had asked them -to borrow from the language of Charles Chaplin -"to tighten die belten." The portrait of the Filipino as a political animal is probably one of the ugliest in the world. Any doubt as to the truth of this statement vanished yesterday as the Filipino race trooped to the polls. There they were the Filipino voters of varying ages and distinctions, exercising an almost sacred right with the recklessness and gay abandon of hooligans on the go. There were, of course, examples of seemly behavior, but these examples hardly altered the general picture. For even in Manila, the act of suffrage was made the fitting occasion for the commission of acts which would disgrace peoples less politically developed than Filipinos. Gangsters, with all the pride that intimacy with politicians brings, were on the loose terrorizing on behalf of their masters. In Tondo, according to reports which have not been denied, voters were corralled like sheep and prevented from reaching the polls. In other parts of the city, so-called political leaders were busy intimidating voters almost under the very noses of police officers. But this -all this- it might be said was the doing of a handful of criminals. True, but we submit that if the average Filipino voter had not been so mercenary, the gangsters of politicians would not have been so distressingly triumphant in their depredations. For what must be admitted is that in the main it is the voters themselves who must be held culpable. Here, for instance, is a scene that has grown familiar. Scores of voters gather around polling places in various forms of repose. Some are seated on their hind legs, some are seated on the sidewalk, some are standing idly by. All, however, are reluctant to go to the polls., until some toughie, with a wad of bills in his hands, come along and makes an offer. The political bums are disdainful or eager, depending on the amount offered. some decide to wait, some accept. The others hesitate and linger on, perhaps to better pastures. In any case, the politicians and their hoods are given excuse enough to develop their contempt that all of them have for the electorate. With this contempt firmly lodged in their minds, these political gangsters become convinced that they can resort to the most flagrant abuse and nothing will happen to them. There will be no protest from their victims, the voters, and there will be no action from the police against whom they know they are sufficiently protected. The result is intimidation on a large scale. The result is corruption of the polls. The result, finally, is the emergence of a class of politicians who are distinguished not by their brains or character or integrity but by their affinity with the lawless and by the power that this affinity creates for them to use as often as they desire. All this is why no foreigner, American or British can write authoritatively on the politics of the Filipinos. Only a Filipino who has lived here all his life can write anything meaningful about so fascinating a subject. He need not be a politician or political scientist. But it is absolutely necessary that he must have some sort of expert knowledge, some intuition, as it were, with which to guide himself in those dark recesses of the politician's mind and soul, there to see and understand the signs of self-interest and the hypocrisy that is used, like an academic solution, to transmute such self-interest into a shining, self-effacing patriotic virtue. Now, one of the outstanding features of the politics of the presidential system is the division of the spoils immediately after the elections. To make the claim that is true only now and not before because of the effectiveness of the civil service is to mouth a piece of aggressive ignorance. For what is nearer the truth is that the Philippines under the Americans or during the commonwealth or as a supposedly sovereign Republic has never had a civil service as this term is understood in Britain, France and Germany. The fixed presidential term which in the U.S. provides a source of stability for American society was transformed in the Philippines as a safeguard for the abuse of the already awesome powers of the President. For under no circumstances can a Filipino President, whatever the magnitude of his thievery and whatever the degree of his incompetence, he removed before his term is over. The provisions for impeachment are a joke, and Congress, under the present system, will always remain a congregation of rascals subservient to the president. But the great mass of the people are as removed from the affairs of political parties as they are from the mainsprings of government. It is true that there are provincial and town committees which are party organizations and in which the voters are supposed to be represented. But even in these small organizations, the local politician has all but the final say. This is specially so if, to use the common expression, such a politician has delivered the goods -meaning pork and patronage. This, however, is not due to the inability of the lower order of politicians to understand and appreciate the democratic value of the two-party system. This us due to the fact that in the Philippines, more so than in any other undeveloped country in this part of the world, politics is practically the only means of livelihood open to the man of more than average talent and ambition. Thus, for themselves as well as for their followers, the politicians of uncertain party identity, completely disregard such notions such as party loyalty and party discipline. Their immediate and perhaps their only concern is to be in power, for to be in power is an insurance of survival. Nor is there any possibility that these problems will be solved in the foreseeable future. For politicians, even the least corrupt among them, are essentially pragmatic. And imprisoned in their pragmatism, they are irrevocably convinced that only by attaining public office can they serve whatever principles they profess and only by yielding to the clamor of the voters can they capture the votes that will keep them in office. This should be read by our incoming politicians. This should be on Manila news today.